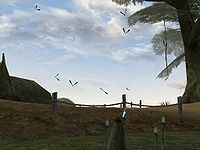 The dragonflies added by this add-on are physical objects, not effects, and as such they have collision boxes. It is not recommended that you jump into a group of dragonflies, as you may find it hard to get out. Esta página foi modificada pela última vez à(s) 22h38min de 27 de agosto de 2013.